Inspired by island life adventures from all over the globe and the culture that revolves around surfing and a fresh & healthy diet. 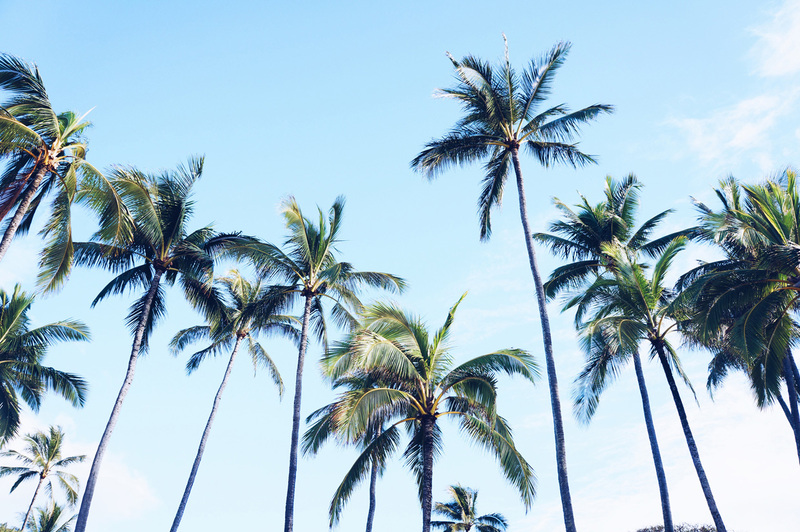 From Hawaii to LA, from Bali to Biarritz. Life is too short, lick the bowl! 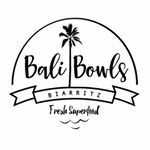 Bali Bowls is the place where you could indulge your sweet tooth, but not feel guilty about it!! A Bali Bowl is basically a really thick smoothie that’s been topped with our homemade granola, locally sourced fruit & superfoods and you eat it with a spoon. ACAI is a delicious purple tropical wonder berry from the Amazon. 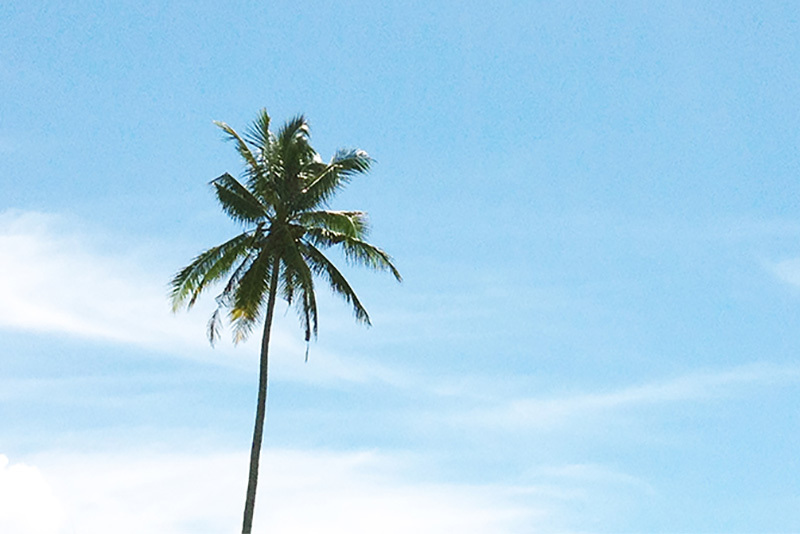 Acai: pronounced as “ah-sah-ee” comes from the Acai Palmtree, which is known to Brazilians as the ’Tree of Life’. 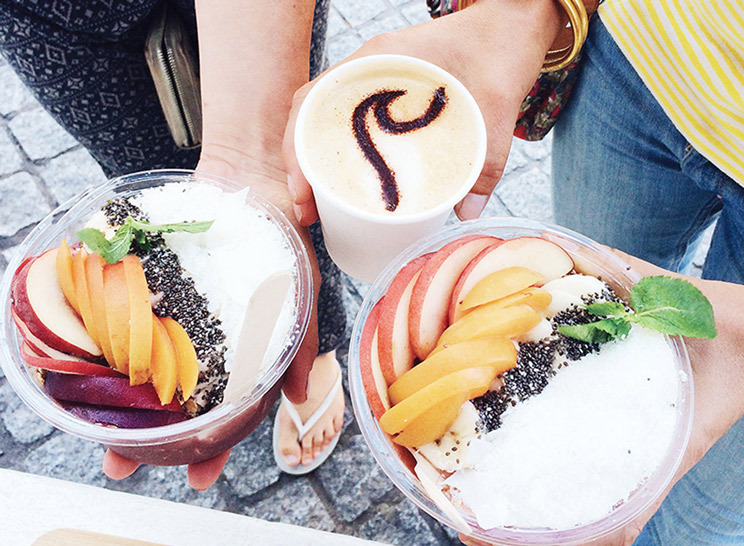 local farmers in the Basque country provide us with fresh fruits, veggies & super foods. Nothing is GMO and our Acai is pure! 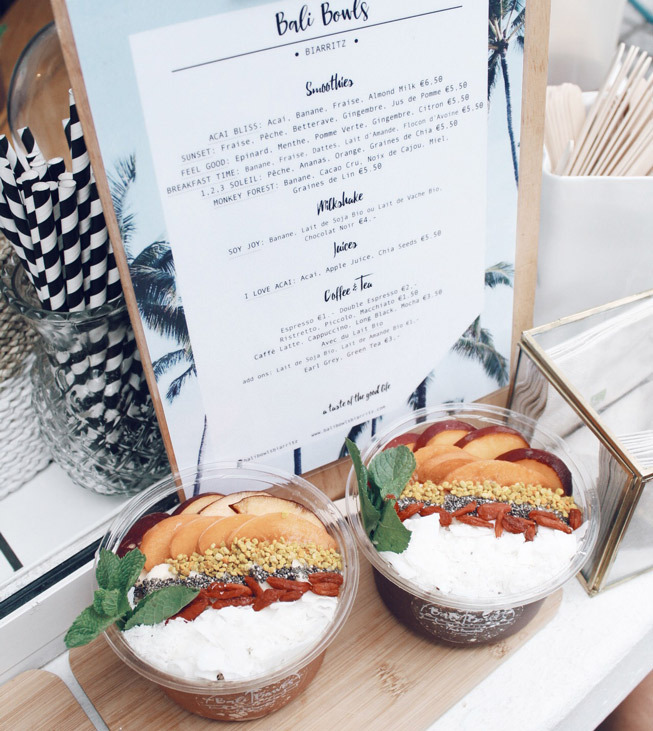 Our menu is predominately raw, vegan, gluten free and completely refined sugar free. 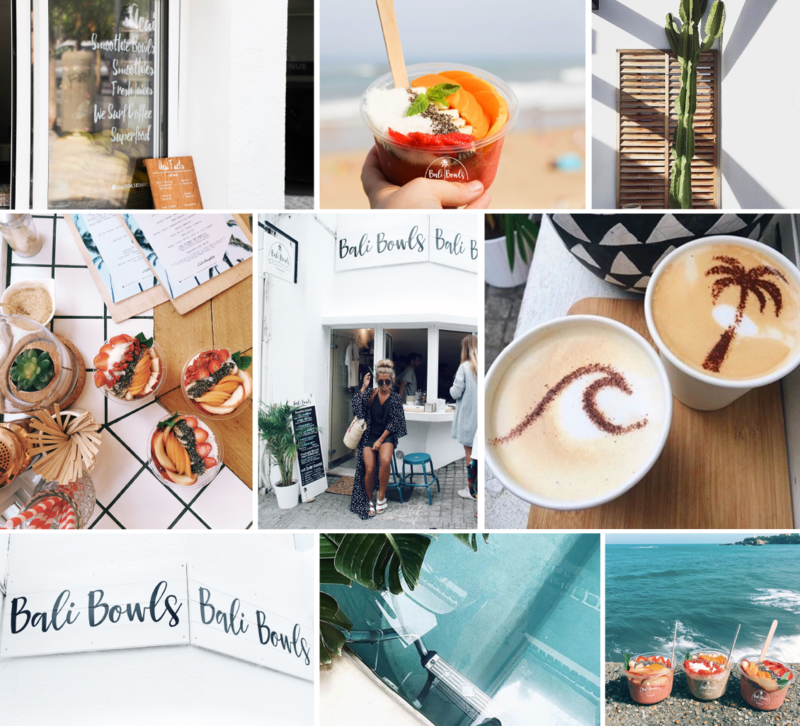 Do not worry, our Bali Bowls are so tasty, you won’t even notice! We are true coffee lovers here at Bali Bowls and we are always sourcing the best and most tasty beans around the world. Our favorites come from Indonesia and we’ve tried to find local beans similar to the ones we love. We are using local beans roasted and blend in The Basque country and we’re sure you like ‘em too! 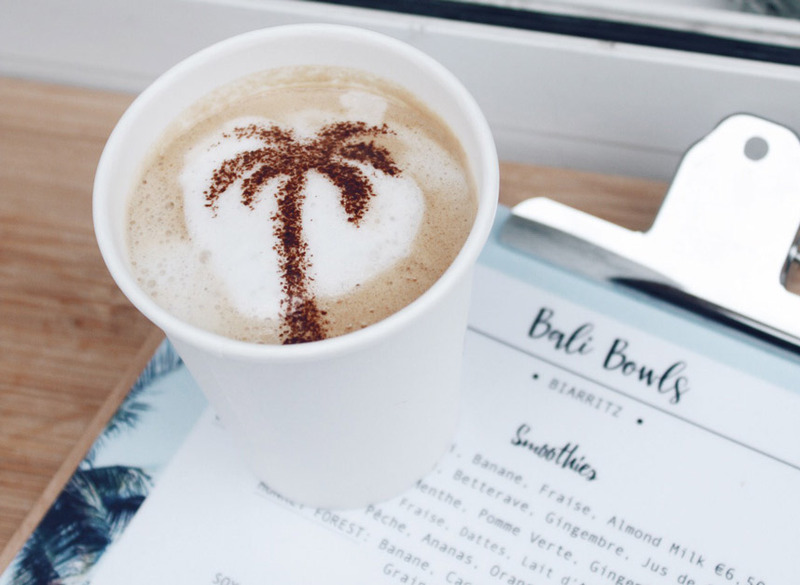 We love our FAEMA coffee machines and our signature palmtree & wave on our cappuccinos. Handmade with biologic raw cacao. A taste of the good life! Simple yet strong. All our bowls & smoothies cups are made of environmental friendly PLA, which is made from cornstarch. 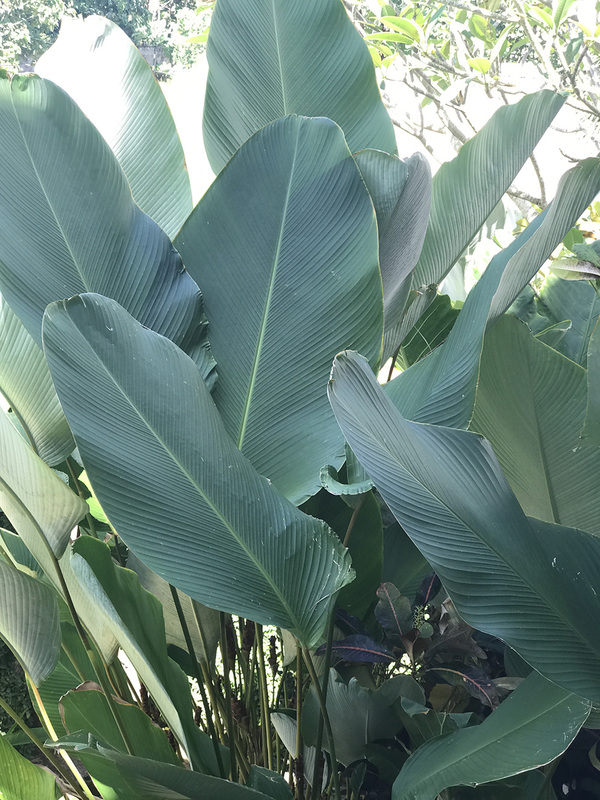 This material is made of renewable resources and it is compostable & biodegradable. Our spoons are from Bamboo, we use paper straws and we try to reduce plastic as much as possible! made fresh to order. Everything we offer happens on the spot! take a little time. The line can get long but…. it’s totally worth the wait, we promise!